In March 2008 the International Civil Aviation Organization (ICAO) introduced legislation requiring all pilots and air traffic controllers working in international airspace to have a standard level of English. Designed to the ICAO descriptors, Aviation English by Macmillan © 2008 presents language, vocabulary and communication skills around 12 non-routine aviation situations. It coaches students to react fluently, clearly, and, most importantly, intelligibly. 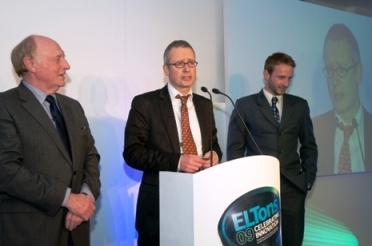 The 2009 British Council Innovation Award, the Eltons, was given to the Aviation product. ceremony by clicking on the picture. There was a famous accident in China in 1993 involving a pilot of a new Western-built airliner carrying about 20 passengers coming into a difficult airfield, surrounded by mountains. He banked too wide and was heading (through cloud) straight for high ground. The plane had an automatic warning system and the alarm started beeping. The pilot didn’t know what it meant; then an automated voice said, “Pull up! Pull up!”. After the crash, they recovered the black box which had the pilot saying to his co-pilot (in Chinese), “What does ‘pull up’ mean?” As a note, the official term used in control tower talk is climb. We are proud to have protected this and the below outstanding products with CD-Cops. - Macmillan English Dictionary, 2002, new edition 2007. The Macmillan English Dictionary won the prestigious English Speaking Union Award for best ELT product in its year of launch. Two years later, the dictionary and accompanying CD-ROM won the British Council Innovation Award. - Macmillan Diccionario Pocket, 2006 A best-selling Spanish bilingual dictionary for learners of English in Spanish secondary schools.